A certain amount of Schadenfreude could be expected when the loudest guy in the room pipes down, and accepts blame—and Cramer admitted to being "wrong" four times on The Daily Show. When Robert Gibbs was asked Friday about Jon Stewart's grilling of CNBC "Mad Money" host Jim Cramer, the White House press secretary flashed a smile, and told reporters that he "enjoyed it thoroughly." Gibbs reaction to the Thursday "Daily Show" interview isn't surprising, given that he and President Obama have been complaining a lot lately about the white noise of "cable chatter" in the midst of financial crisis. But is the public also ready to tune out the talking heads? Media critics, at least, seem to be. Variety proclaimed Thursday's "Daily Show" interview—which followed an eight-minute monologue last week in which Stewart bashed CNBC for “cheap populism” and bad predictions—"the most foolish appearance by someone whose name sounded like 'Cramer' since 'Seinfeld' went off the air," while others called it "a beat-down" (The Chicago Tribune); "a massacre" (Huffington Post); and a "remarkable public service [in] gutting Cramer" (The Baltimore Sun). A certain amount of Schadenfreude could be expected when the loudest guy in the room pipes down, and accepts blame—and Cramer admitted to being "wrong" four times on Thursday night. But much of the piling on seemed to be less about Cramer than about how cable news—and particularly cable business news—covers serious topics in what are, for most Americans, serious times. "You knew what the banks were doing, and yet were touting it for months and months," Stewart said. "The entire network was. And so now to pretend that this was some sort of crazy, once-in-a-lifetime tsunami that nobody could have seen coming is disingenuous at best and criminal at worst." The never publicity-shy Cramer skipped a scheduled appearance Friday on "Morning Joe" that was billed as his first chance to discuss the "Daily Show" debate; host Joe Scarborough noted on Twitter that Cramer "had a late night." And TVNewser reported that MSNBC asked producers to leave the Stewart-Cramer interview out of their shows, with CNBC hosts also saying little about the interview. That's a far cry from CNBC's initial reaction to Rick Santelli's rant on the floor of the Chicago Mercantile Exchange last month. At that time, the business network—as well as NBC and MSNBC—continued hyping the incident for days, while the CNBC website highlighted classic Santelli rants on —before the reporter, who now seems to be somewhat under wraps, canceled a scheduled interview on the "Daily Show." "CNBC produces more than 150 hours of live television a week that includes more than 850 interviews in the service of exposing all sides of every critical financial and economic issue," said CNBC spokesperson Brian Steel in statement Friday. "We are proud of our record and remain committed to delivering coverage in real-time during this extraordinary story and beyond." Chris Roush, who teaches business journalism at the University of North Carolina, said that when it comes to covering the economic crisis on cable, "the more that CNBC allows its reporters and anchors to state their opinions instead of simply reporting facts, the more it will hurt CNBC in the long run." The increasingly opinionated dispatches from CNBC's stars parallels MSNBC’s shift during the 2008 campaign to more aggressively opinionated commentary, and could similarly overshadow the actual reporting done by the business network’s rank-and-file. Even so, Roush contends that incorporating opinion into reporting on business different than doing the same with political coverage. "When you state an opinion and you're wrong" in business news, "you cause people to lose millions or billions of dollars," said Roush. "Stating opinion with business news is extremely dangerous. Stating politics in political news is not as dangerous because people know that the person is stating their political viewpoint." And while political prognostications are more subjective, Cramer talking up Bear Stearns stock days before it tanks is a quantifiable mistake. Still, viewers have at times grown weary of cable television's need for heated political debate shows—most notably, following Stewart's October 2004 appearance on CNN's "Crossfire." There, Stewart told hosts Tucker Carlson and Paul Begala that they should "stop hurting America." "I'm here to confront you," Stewart said, "because we need help from the media and they're hurting us." Stewart was declared the victor by many in the media after that appearance, and less than three months later CNN pulled the plug on the 22-year-old right-left shout-fest. Upon "Crossfire's" cancelation, network president Jon Klein noted the Stewart critique, telling the Washington Post that "he made a good point about the noise level of these types of shows, which does nothing to illuminate the issues of the day." Carlson, reached Friday, described Stewart as "a partisan demagogue." 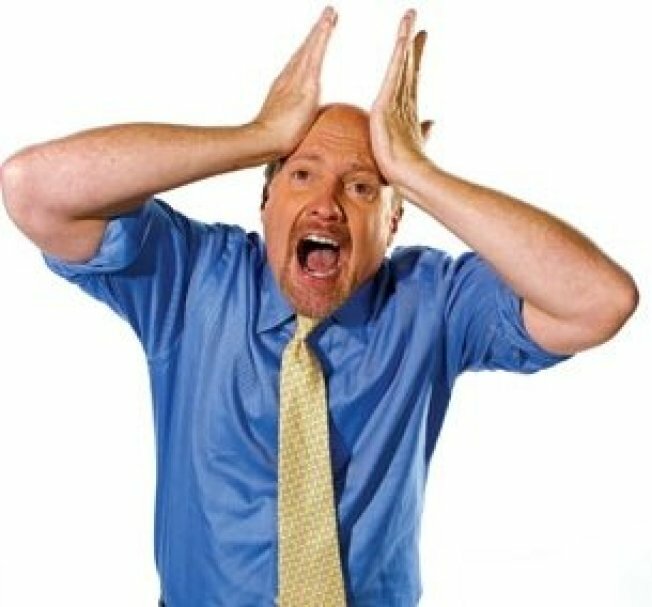 "Jim Cramer may be sweaty and pathetic—he certainly was last night—but he's not responsible for the current recession," Carlson told POLITICO. "His real sin was attacking Obama's economic policies. If he hadn't done that, Stewart never would have gone after him. Stewart's doing Obama's bidding. It's that simple." Begala said that "as an Overpaid TV Guy myself, I hate to see the Overpaid TV Community ripped apart in this time of crisis." As to whether Stewart's takedown could again impact cable punditry, Begala said he had "no clue." And simply because media pundits hyperventilate when Stewart wags his finger, it doesn't mean network executives will respond accordingly. Three years after the "Crossfire," appearance, Stewart blasted Chris Matthews, describing the MSNBC anchor's self-help-styled book "Life's a Campaign" as a "recipe for sadness." Although Matthews dubbed it "the worst interview I've ever had in my life"—and it became a YouTube staple—Matthews continues shouting on a nightly basis. The now famous "Crossfire" appearance came after Stewart made similar criticisms of the network in a little-noticed 2002 interview with Howard Kurtz. Beyond Stewart’s takedown and the television critics frothing at the mouth, CNBC brass will surely be looking at the numbers to see if the recent publicity’s been a good thing. It’s too soon to tell, but early numbers show a slight dip. Portfolio’s Jeff Bercovici noted Friday that looking at the first three days this week, CNBC's Business Day programming block dropped 10 percent in the key adults 25-54 demographic, and 11 percent overall. But the problem extends further than Cramer’s “Daily Show” sit-down, according to Andrew Tyndall, an independent television news analyst and proprietor of the Tyndall Report website. "It is not the shouting that Stewart is objecting to at CNBC," Tyndall said. "It's the shilling." Tyndall explained that the "raison d'etre” of a network like CNBC is to persuade viewers that "the best measure of prosperity in an economy is the value of financial assets," and that the markets are rational, efficient, and civic-minded. But as the country's mood shifts, such highly-paid, highly-opinionated business pundits might run into trouble if successfully depicted as being in the pocket of Wall Street rather than fighting for Main Street. "The reason voices are raised is because the disagreement is stark and crucial," Tyndall said. "The entire neo-liberal economic orthodoxy is at risk of being discredited. If that goes, CNBC's foundational identity goes with it."